Concerns over rising interest rates and expected further rate increases have hit several stocks hard during the fourth quarter. NASDAQ and Russell 2000 indices were already in correction territory. More importantly, Russell 2000 ETF (IWM) underperformed the larger S&P 500 ETF (SPY) by nearly 7 percentage points in the fourth quarter. Hedge funds and institutional investors tracked by Insider Monkey usually invest a disproportionate amount of their portfolios in smaller cap stocks. We have been receiving indications that hedge funds were paring back their overall exposure and this is one of the factors behind the recent movements in major indices. In this article, we will take a closer look at hedge fund sentiment towards Humana Inc (NYSE:HUM). Humana Inc (NYSE:HUM) has experienced an increase in hedge fund interest lately. 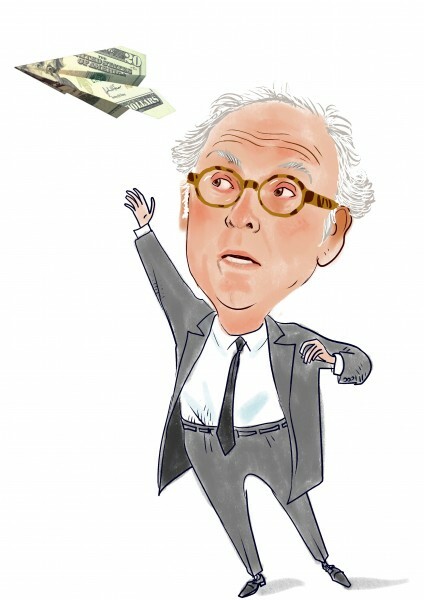 Our calculations also showed that HUM isn’t among the 30 most popular stocks among hedge funds. We’re going to take a look at the new hedge fund action regarding Humana Inc (NYSE:HUM). What have hedge funds been doing with Humana Inc (NYSE:HUM)? At Q4’s end, a total of 46 of the hedge funds tracked by Insider Monkey held long positions in this stock, a change of 5% from the second quarter of 2018. 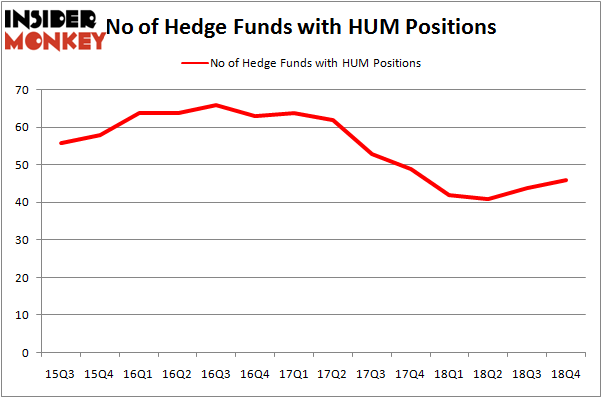 On the other hand, there were a total of 42 hedge funds with a bullish position in HUM a year ago. With hedge funds’ positions undergoing their usual ebb and flow, there exists a select group of notable hedge fund managers who were boosting their stakes meaningfully (or already accumulated large positions). According to publicly available hedge fund and institutional investor holdings data compiled by Insider Monkey, Jim Simons’s Renaissance Technologies has the number one position in Humana Inc (NYSE:HUM), worth close to $1.0049 billion, comprising 1.1% of its total 13F portfolio. The second largest stake is held by AQR Capital Management, led by Cliff Asness, holding a $778.9 million position; 0.9% of its 13F portfolio is allocated to the stock. Some other professional money managers with similar optimism include Israel Englander’s Millennium Management, Christopher James’s Partner Fund Management and Noam Gottesman’s GLG Partners. As aggregate interest increased, some big names were breaking ground themselves. Glenview Capital, managed by Larry Robbins, assembled the most valuable position in Humana Inc (NYSE:HUM). Glenview Capital had $53.1 million invested in the company at the end of the quarter. Benjamin A. Smith’s Laurion Capital Management also made a $12.1 million investment in the stock during the quarter. The following funds were also among the new HUM investors: Sander Gerber’s Hudson Bay Capital Management, Charles Clough’s Clough Capital Partners, and Joe DiMenna’s ZWEIG DIMENNA PARTNERS. Let’s check out hedge fund activity in other stocks – not necessarily in the same industry as Humana Inc (NYSE:HUM) but similarly valued. These stocks are Brookfield Asset Management Inc. (NYSE:BAM), Mizuho Financial Group Inc. (NYSE:MFG), Waste Management, Inc. (NYSE:WM), and Emerson Electric Co. (NYSE:EMR). This group of stocks’ market values are closest to HUM’s market value. As you can see these stocks had an average of 24.75 hedge funds with bullish positions and the average amount invested in these stocks was $1245 million. That figure was $2931 million in HUM’s case. Waste Management, Inc. (NYSE:WM) is the most popular stock in this table. On the other hand Mizuho Financial Group Inc. (NYSE:MFG) is the least popular one with only 4 bullish hedge fund positions. Compared to these stocks Humana Inc (NYSE:HUM) is more popular among hedge funds. Considering that hedge funds are fond of this stock in relation to its market cap peers, it may be a good idea to analyze it in detail and potentially include it in your portfolio. Our calculations showed that top 15 most popular stocks among hedge funds returned 19.7% through March 15th and outperformed the S&P 500 ETF (SPY) by 6.6 percentage points. Unfortunately HUM wasn’t in this group. Hedge funds that bet on HUM were disappointed as the stock lost 2.2% and underperformed the market. If you are interested in investing in large cap stocks, you should check out the top 15 hedge fund stocks as 13 of these outperformed the market.